Congratulations to the 2008 Award Recipients! GEM Health Care Services (GEM HCS) leads the way in actively hiring skilled immigrants through its training programs. The majority of participants in GEM HCS’s Personal Support Worker Training Program (PSWT) have emigrated from other countries. The program provides a bridging process for immigrants to receive Canadian healthcare work skills training and also contributes to an ongoing pool of health human resources for GEM Health Care Services. GEM HCS has hired and trained over 500 PSWTs since 2000. In addition to the PSWT Program, GEM HCS provides training through the GEM HCS Patient/Client Sitter Training Program. That program has helped recent immigrants to Canada adapt to the Canadian workplace health care setting through work assignments. GEM HCS often gives the immigrant their first job in Canada. “We are pleased to receive this award in recognition of employee recruitment,” said Gaye Moffett, Founder, President and CEO of GEM HCS. “In addition to our recruitment efforts, we are continually adapting our workplace environment to create a welcoming and inclusive environment for persons of diverse backgrounds and cultures.” For instance, GEM HCS recognizes employee needs for religious observances, demonstrates sensitivity to dietary restrictions associated with various cultures and religions and ensures culturally competent care. GEM HCS also maintains a payroll system of in-person cheque payments to staff. This ensures that GEM HCS Head Office maintains a close working relationship with all its employees for meetings, on the job training, coaching and sharing of company/client information. Algonquin College has launched a focused strategic initiative which supports the pathway to employment for immigrants and the internationally trained. Algonquin is thankful to the many organizations, community groups, and individuals that have assisted in the development and delivery of programs. The College is committed to enhancing student success by providing enriching and challenging learning experiences through engaged employees. Recognizing the ongoing need to service Ontario’s changing population demographics, Algonquin makes employee development a strategic priority. As an example, this year, Algonquin will be providing cross cultural competency training to front-line staff, recruiters, faculty, counselors, advisers, and student success staff. Algonquin coordinates and provides differentiating services to immigrants and the internationally trained in the areas of settlement, language assessment, academic advisement and integration, prior Learning Assessment Recognition, foreign credential recognition, profession-specific mentoring, skills training, sector and profession education requirements, and employment preparation and hiring and recruitment. Algonquin is currently working with external stakeholders and community groups to continually align Human Resource practices as they relate to the immigrant and internationally trained talent pool. 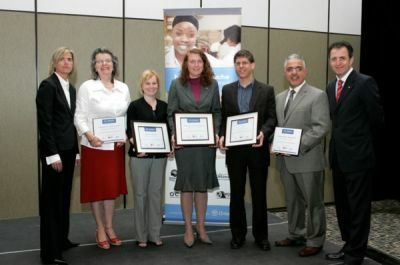 The following organizations were also recognized for their promising practices in the recruitment of skilled immigrants CGI, MBNA and Scotiabank.